Creativity, the key of technical wonders. And we are extremely happy to announce that our new project for “St. Patrick’s Academy” has been launched. It’s a finest model that automates all such manual works in an educational institution. St. Patrick’s Academy, Angamaly is established by the Congregation of the Brothers of St. Patrick, India and is registered as the Educational Society of the Brothers of St. Patrick , Angamaly. 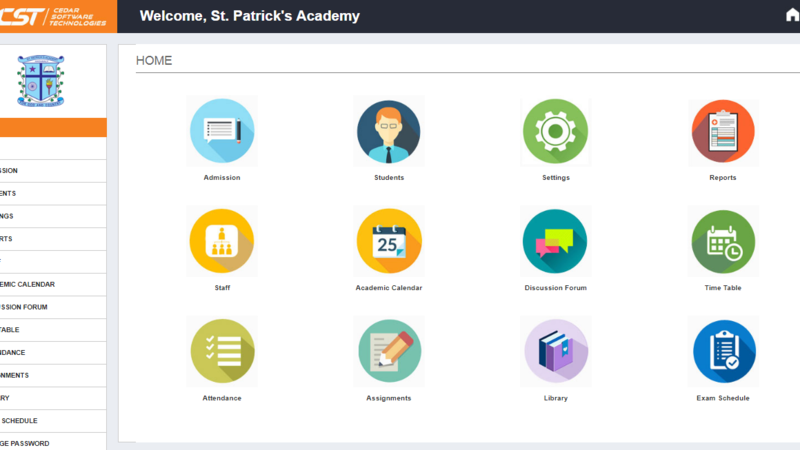 The website is used for maintaining the class system of St. Patrick’s more efficiently. It’s a total general purpose online product that will manage the entire information of students and teachers. Our project is designed to get all the information under a single platform. This application helps department to keep in touch with parents/guardians with the mutual interest of students. Here parents will have the option of receiving text alerts in the form of SMS regarding the marks and attendance of students. The system is capable of offering operational safety and reliability to the features that include admission, students, report, staff, academic calendar, discussion forum, time table, attendance, assignments, library and exam schedule. Through these key features, it supports each and every academic communication between students, teachers and parents as such it is simple to use and shows all updates of communication that is being shared. We are happy to reveal that this is our most reputed and secure project that we had held till now, and this is another golden feather to our tagline as the best web development company in Kochi..We hope that people will definitely get positive user experience from this project .